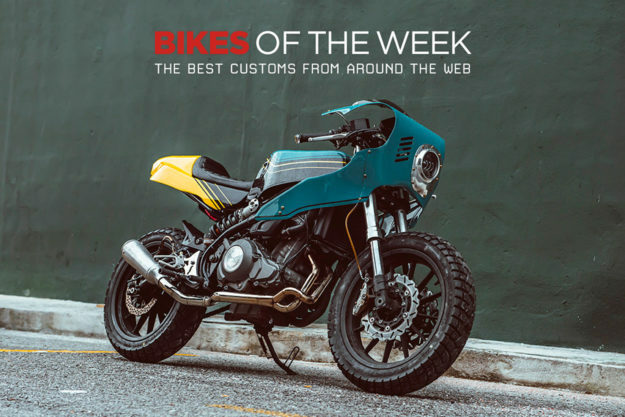 A super-fresh Benelli from Malaysia, a Harley cafe racer from Japan, and a Sportster street tracker from Sweden. Plus a wild Indian Scout from a NASA engineer. Enjoy. 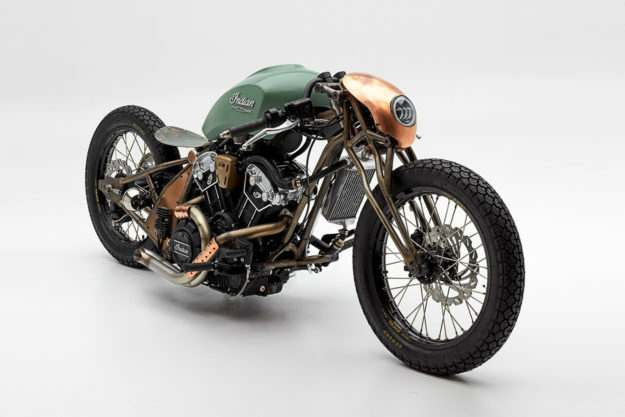 Indian Scout Bobber by Alfredo Juarez The results are in from the Indian Scout Bobber Build-Off, and even though the cafe’d version we showed you a few weeks ago didn’t win, we’re not disappointed with the final result. NASA engineer Alfredo Juarez is the man behind the winning machine, with this elegant bit of old-skool chopper work. Alfredo describes himself as having an engineer’s brain but an artist’s heart—so form and function are in complete symbiosis with this build. He wanted to showcase that magnificent V-Twin, so he let his grey matter calculate how to make it a stressed member. 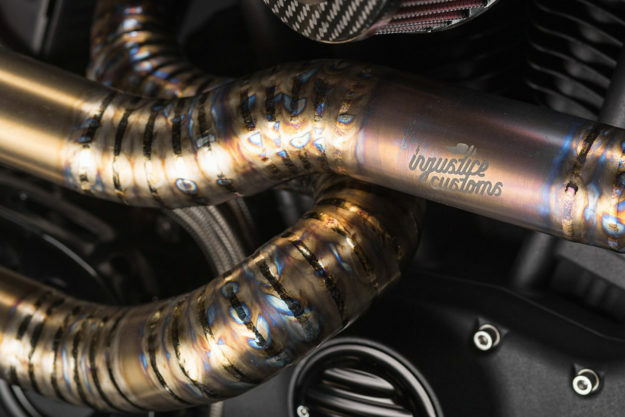 Working from scaled drawings, Alfredo grafted a new frame from 1-inch 4130 Chromoly tube and then used drawn-over-mandrel tubing to create that exquisite front end. The Scout’s tank was modified so it would sit just right on the new spine, and a set of scripted badges was fixed in place of the block lettering from the factory. 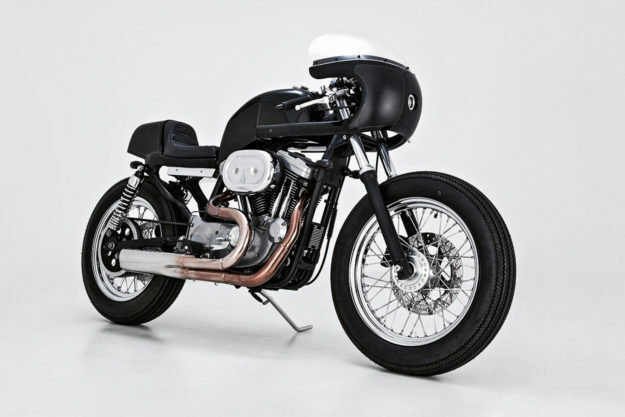 Harley Sportster by Tetsu Mitsuhashi After working for years under the scrutinizing eye of Aki Sakamoto of Hog Killers, Tetsu Mitsuhashi has learned the art of an exacting touch. 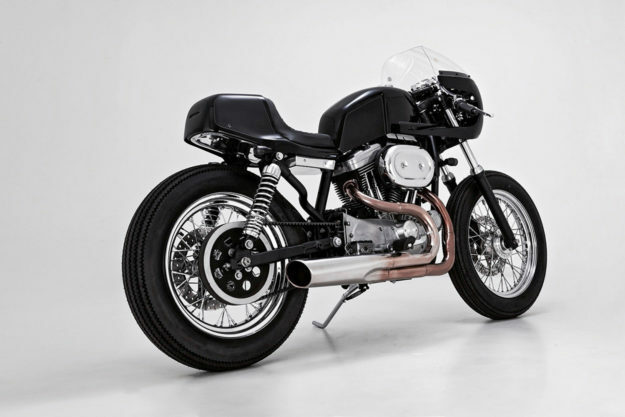 So it’s no surprise that his first build looks as tightly knit as this Sportster cafe racer. Working from a 2001 XL1200, Tetsu handcrafted everything on this build, save for the engine and the core of the cradle frame. 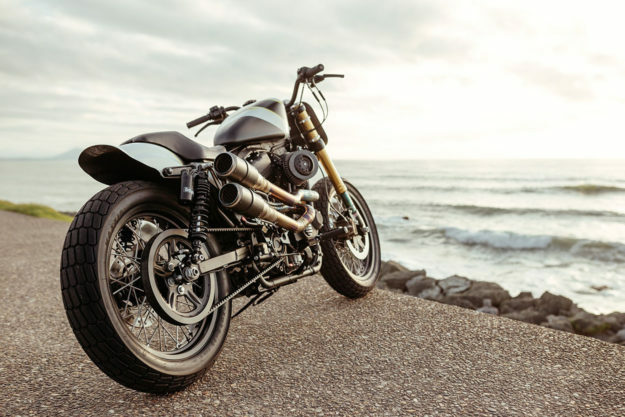 A Dunstall style fairing delivers a slender and stylish bit of aero that to give this Sportster a slimming appearance. That vibe continues with Tetsu’s treatment of the fuel cell, which appears pinched instead of fully scalloped. The modified subframe sits nice and flat and, thanks to creative relocating of the oil tank to the rear tail hump, delivers excellent use of negative space. A pair of Progressive shocks have been fitted in the rear to help accentuate that cafe stance. 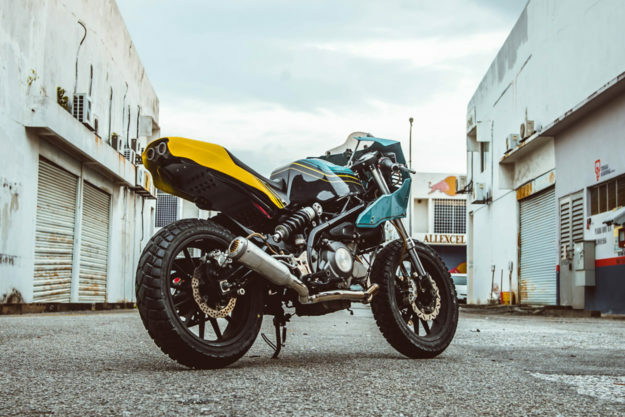 Benelli TNT 300 by Beautiful Machines When it comes to custom styling trends, SE Asian builders seem to march to the beat of their own drum. We’re constantly amazed by the new concepts and directions they’re exploring—and Arthur Loh and Malaysia’s Beautiful Machines are doing it even better than most. 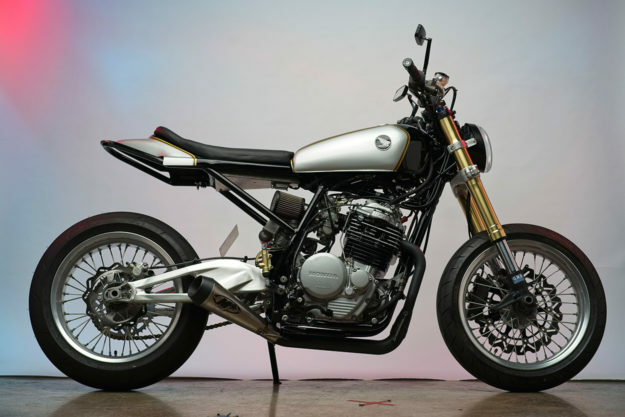 This latest BM build is this funky take on the cafe racer theme that, and it’s been fabricated as a bolt-on kit: All you need is some basic spanner-spinning know-how, and a spare Benelli TNT 300 in your garage. Of course, creating the bits and pieces that make this transition easy was no walk in the park. The machining and sheet metal work is top notch. The tank is an all-new aluminum unit with its mounting points matched to those of the stock cell. 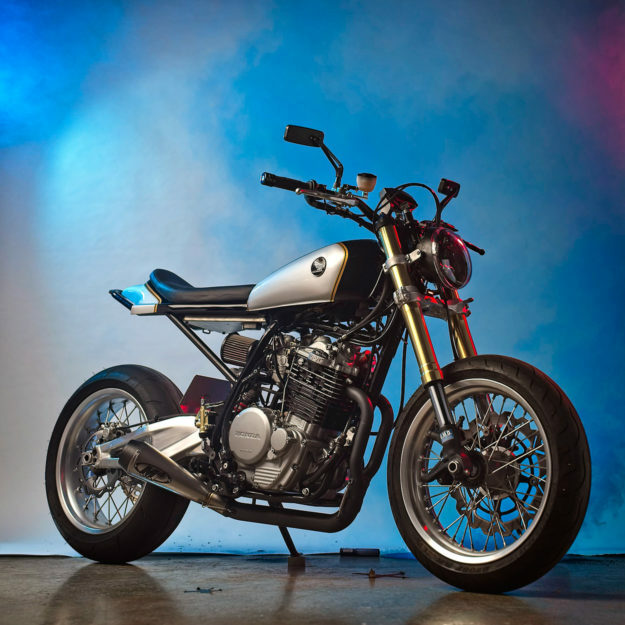 Honda XL600R by the Lloyd Brothers If you frequent this space, the Lloyd Brothers are no strangers to your lexicon. Their fabrication skills have been helping Ducatis carve grooves in the dirt oval for almost a decade now, and they toyed with street legality last year. 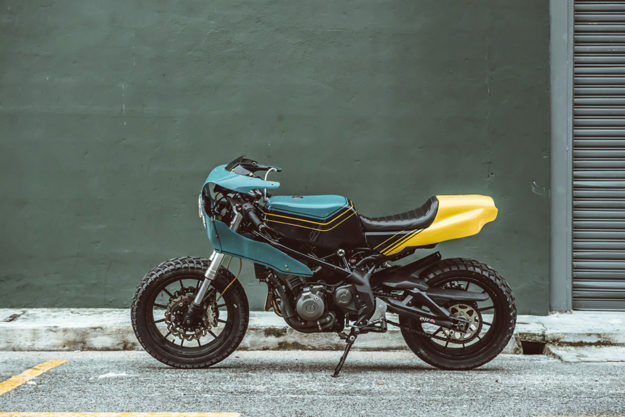 This traffic-dodging tracker is based on a Honda XL600R. It was a father-and-son project when the eldest Lloyd brother, Bill, donated it to younger brother David and his son James. With only 2,700 miles on the clock, the engine was practically new—so most of the attention was turned elsewhere. The wheels, brakes and Pro-Link swing arm have been swapped for units from an ex-racer Aprilia SXV 550. There’s a new subframe from Desmo Pro race team member Rich Lambrects, now topped with a Woods Rotax-inspired tail. Race Tech internals inside GSX-R forks and an R6 shock keep the Honda planted in corners. 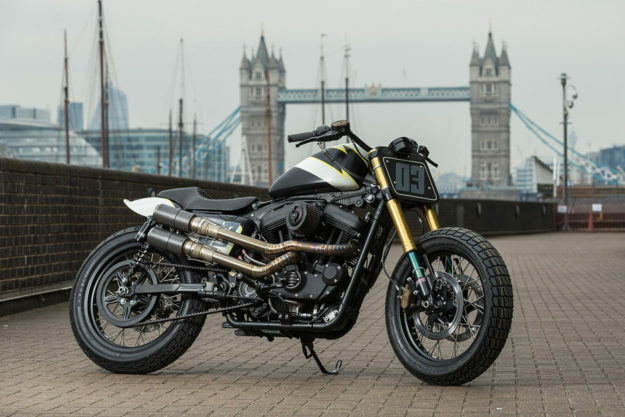 Harley Sportster street tracker by Injustice Customs You may have noticed that The Motor Company pulled the wraps off another new bike earlier this week. 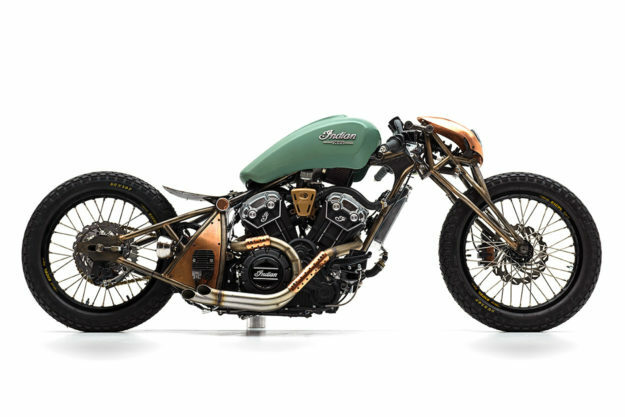 And while the FXDR 114 has a healthy dose of badassery going on, we’d rather see something like this street tracker in their lineup. 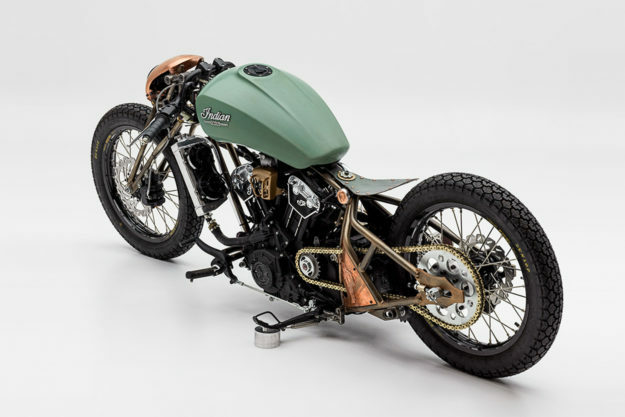 It’s a once-stolen Sportster Roadster and Anton Knutsson, the man behind Stockholm’s Injustice Customs, had never wrenched on a Harley before tackling this project. Which is a surprise because he’s absolutely nailed things here. The tweaking of the subframe and snubbing of the fender suit this bike to a T, and do a fantastic job of showcasing the seat. A set of tracker bars sits atop the stock H-D triples but the forks have been reworked with a set of stiffer springs. Out back, Anton went with Öhlins to keep the 19-inch Maxxis DTR-1 hoops planted.